47 Christmas Songs-47 Different Groups-3 Hours of music in a Boxed Set with extensive liner notes. Every musical genre is represented. $3.00 from each sale goes to the Humane Society (where the cute dog came from). 3 Hours of Holiday music in every musical style make up Tramper's Dynamic Christmas boxed set of originals and standards performed like you've never heard before! 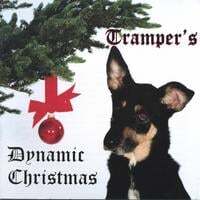 Tramper, the Dynamic dog on the cover, had her original home at The Humane Society at Lollypop Farm, and although she is not performing on the CDs named for her, she was the inspiration for this great recording project and money from each sale goes to benefit her original home. Bring great music into your home for the holidays - and help our homeless furry friends and companions at the same time. Ballads, classics, rock'n'roll, Blues, originals, country, jazz, folk, world beat, Gospel - it's all here with something for everyone's musical taste. From big musical productions to straight forward vocal and guitar, and everything in between, each production is excellent. After I asked for the chance to hear (the fascinating) Carousel Christmas from Dynamic Records, I received a package containing both Carousel Christmas and Tramper's Dynamic Christmas. Oh, great, thinks I, more animal music! Well, joy! Rapture! It's not animal music at all, but one of the finest "various artists" collections I have heard, and by far the largest and most various. Dynamic has put together a 3 CD set of enchanting Christmas songs--47 songs, count 'em--in a wide variety of moods and styles. Although it will be difficult to characterize this wide-ranging collection, I'll try. The three CDs contain a good sampling of sacred, seasonal, and Santa songs. Many of the traditional favorites are covered, at times in quite unconventional arrangements. And there are several nice original songs, too. For choral music fans, there is the St. John The Evangelist Adult Choir (Michael Szatkowski, Director) with a traditional arrangement of Do You Hear What I Hear. And Beth Schroeder picks and sings a slightly jazzed up Santa Claus Is Coming to Town. I'm trying to give an idea of the range of styles appearing on this set, and I'm only scratching the surface. I love regional recordings, because they can offer so much more value than what the major record labels get away with producing. This music really makes a strong case. The other thing that stands out for me about this offering is that the people who put this project together clearly care about Christmas and about their community. That always makes a difference in how I listen to a recording. The liner notes say that $3.00 from each copy of this recording (which lists at $19.95--a "best buy") goes to the Humane Society of Rochester and Monroe County. I highly recommend this Exceptional collection. An album I keep coming back to. From R&B to folk, this varied CD set has something for every musical taste. Lots of the songs are originals as well. As someone who has a large (200+) mostly folk Christmas CD collection, I highly recommend this compilation! I am a certified Yulehead and collect all types of Christmas music so I am always looking for items that are out of the mainstream. This compilation of Rochester NY area artists fits the bill. Over the span of 3 CDs there are original tunes, well known and obscure Christmas songs all played with the sincerity that only independent artists/labels seem to be producing these days. Sure, there are a few moments where the artist's amatuer status shows thru but I consider these like marks in fine leather. I can't think of a true clinker in the whole bunch. There are several that I plan on putting on this year's Christmas compilation knowing they will become new holiday favorites. That a percentage of the purchase price is being donated to benefit animals is just icing on the cake. It's all here from cantatas to blues to personal statements about Christmas. This one has been in the CD player for weeks and it's only October.